This is the perfect program for marriage minded people. 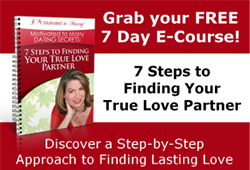 Are you ready to learn the secrets of finding and keeping true love? Do you want to find that someone special sooner than later? Get my proven step by step systematic approach to finding lasting love that I use with my own one-on-one private clients. You will learn the Motivated to Marry Mindset, the 3 keys to being happy in a relationship, how to keep your confidence on solid ground during the ups and downs of dating, where to meet people that you will have the best chances with which to connect, how to save time by choosing wisely who you date, how to get what you need from a relationship, and how to put together your personally tailored Motivated to Marry dating plan and much, much more. There are 8 modules each featuring a training audio, an action lesson guide and critical coaching questions to guide you through each step. During different times of the year, I give this program as a live group experience where you will have access to live Q&A calls and an interactive member’s forum. If the live group version is not currently in session, then don’t worry since you will have immediate access to the entire program so you can start working right away with this valuable information. Internet Dating is one of the top ways of meeting your spouse today. Are you taking full advantage of the online dating world to find your romantic partner? Did you know that 2/3 of Coach Amy’s successful clients who are in loving relationships met online? With one out of five marriages resulting from online dating, online dating needs to be part of your entire dating plan. In this program, I give my step by step proven system to meeting quality people who you want to be dating. Learn my proprietary system to online dating that has worked for so many of my clients. I show you how to write a profile that will attract the right one, how to decide which site to go on, how to create a profile that will attract the kind of people you want to date, to have a better understanding of the dating process so you can authentically connect with that special person and keep yourself safe at the same time, and some out of the box dating possibilities given social media. You even get a bonus module on how to successfully date long distance. This program includes 6 audio training, transcripts of those audios, 6 lesson guides, handouts and articles that will transform the way you are dating online to make a huge difference. You also get some very special bonuses with the Successful Internet Dating Program. This 40 page, information-packed, transformational e-book started it all! It has the key concepts to learn how to date the Motivated to Marry way so you will become clear who is good partner for you, will keep confident about yourself and that you deserve to be loved. This book show has a list of The Characteristics of a Motivated to Marry Dater and give you the appropriate timeframes based upon your age that you should stay in a relationship before expecting an engagement ring. If you are in a relationship, take the quiz: Is Your Partner Motivated to Marry? and see if your partner is truly marriage minded.